As of today I am happy to announce jinxxxygirl is the winner!! Thanks for entering you gals! You are wonderful! The 2011 One World One Heart Blog giveaway has started! A little intro, I am Kellie and I have been creating art since I was young. Art time with mom was a cherished time. I would altered any found object and paint them until my hearts content. After art school work and kids took over but I realized art need a place for my sanity! Thank God for etsy! Now I create for sanity on the side, with my daughter. I spend a lot of time working with etsy team Columbus and raising money for local non profits here in Columbus. And now for the give away! This year I am giving away fun soda cap magnets!! 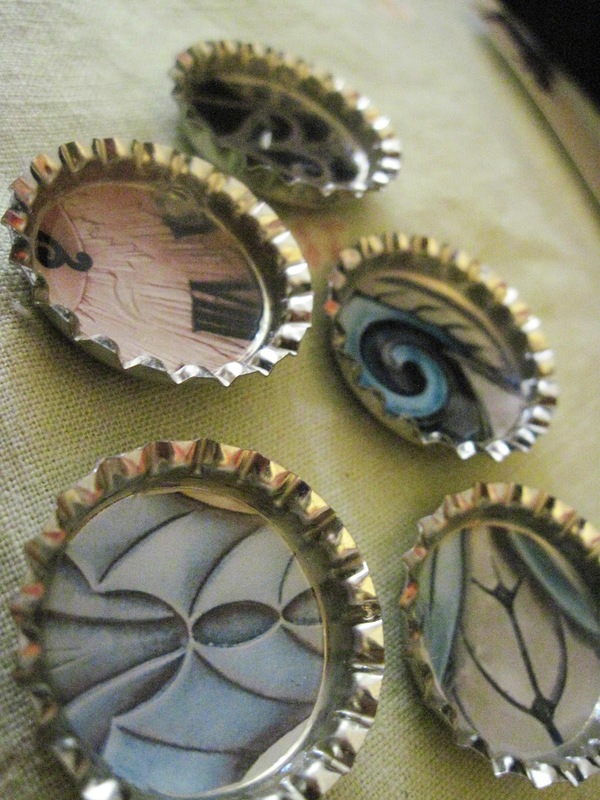 5 Gothic Pattern bottle cap super strong magnets from my shop! If you would like to win, just leave a comment! Now remember to win these magnets, you need to leave a comment to this blog post. then we will announce the winner on Feb 17th! Hi there, hope you are enjoying the ride. Please call on me at #100 if you have the chance. These are nice! Welcome to OHOW 2011. Wish this wasn't the last year. This is actually my first blog hop. Its great! Hi Kellie -love the magnets. These are beautiful! I hope I win I love magnets!!! How wonderful! Love them so much & I have to admit that my favorite entry on your blog in my short visit there was the biology of a frog. I laughed so loud my Scottie girl started to growl. Nice to met you. Hope you have oodles of fun during OWOH. I've enjoyed it so much over the years seeing all of the wonderful blogs and meeting everyone. Thanks for your participation in the event. I guess this makes me the first to post. Goodie! Hi from East Tennessee. Nice to meet you, Kellie. Love the goth bottle magnets. Please do add my name to your drawing. I love magnets and yours are beautiful. hello from Ohio,US! I like your blog and the beautiful magnets you made !Looking forward to knowing you better! Cool Beans!I am so glad I stopped by your blog!I am having so much fun on the OWOH tour! Please wander over to my blog if you can. Hi Kellie! Can't wait to visit your Etsy shop! These magnets are so cute. Would love to win them. Fabulous magnets! I'd love a chance to win. OMG! Those are soooo cool! Chris even loved them. He said he wants a set for his fridge. How much for a set? I would like a set too. You do awesome work Kellie! Greetings from Northern Virginia, USA. I'd love a chance at your prize! Thanks. Thank you for being apart of the OWOH journey around the world...Your giveaway is super exciting! Thank you for the chance to win your giveaway ^_^ Very cool..love magnets to hang my son's art work. I enoyed visiting your blog. and thankyou for the opportunity to win your interesting magnets door prize. Wonderful magnets. Please inlcude me in your drawing. Heellllooo from Texas Kellie! Love these magnets! Thanks for the chance to win them!!! These are so cool! Please add me to your list of participants and hope you will stop over to my blog- at #259. I am giving away hand made cards. Hello from Cody, Wyoming USA. I enjoyed visiting your blog and learning a little about you. Love your bottle cap giveaways...so fun. Please enter me. If you have a moment stop by and enter these giveaways too. Very cute! would love to win these. OWOH is a great trip around the (blog)world, thanks! Great giveaway ! please count me in thanks!! Cap magnets, love this idea. i am having a ball!!! Hi from the UK! Lovely blog and a lovely giveaway. Please enter me. If you have the time stop by and see me too. hello, these magnets are great, it's such fun meeting you! pop over to me for a visit! Nice prize, I'm sure I could make good use of these magnets. Have fun on the OWOH ride. Those are adorable, I would love to win! Hello from southeastern Massachusetts. I will be back after OWOH is over to spend more time. Thanks for the opportunity of winning your lovely giveaway. That's a lovely bit of upcycling you've got going here - what clever creations! I'd love to win these! It would be a great reminder to see everytime that I joined OWOH. Hi Kellie ! Cute magnets ! Thanks for the chnace to in. I hope you enjoythe OWOH ride ! So totally awesome! Please count me in! what wonderful giveaway...please count me in...i'm number 437 on the list.. enjoy the ride! Those magnets are pretty cool, I must say. And I like the thing with the corks. If I ever get them finished, I'll have 3 framed cork boards. I’ve enjoyed browsing your blog and artwork! Great giveaway. Come see me at #769. Cheers! Very cool giveaway! I really like your work. Please stop on by my direction as well. OWOH 760. What a wonderful door prize! Thanks for the chance to win! Please visit me at Irish Muses #678.
hello from Ohio! Thanks for being a part of OWOH, it's been an awesome journey and your bottle caps are a wonderful addition! Saw your blog post about that disected yarn frog. too funny! come visit sometime. Is astonished! So a wonderful Giveaway. I try to win it. You have here a very nice Blog. Hello there :) Nice to meet you! Just quickly glanced at your blog & will definitely have to come back later to see more! Please enter me in your giveaway. I'd love to win! And please visit my blog & sign up for my giveaway, if you haven't already. Those are cool magnets. please count me in! I’ve enjoyed looking through your blog and your work is wonderful. Stop by and visit mine for a chance to win my door prize. In the meantime, I hope this journey is as fun for you as it is for me. Hi Kellie... lovely magnets & pleased you found Etsy (& stayed sane) I'm pleased to meet you (I'm Shelle from Sunshine Coast Australia) If you have time (I don't think I've seen you visit, but could be just dazed from dancing around the world LOL) I'd love you to come on over check out my giveaways & comment at my OWOH post too :) oh & please feel free to drop in now and then after OWOH if you're in the bloggersphere :) that'd be cool! Now let's enjoy this hurly burly wonderful One World One Heart EXTRAVAGANZA :) There's lot's more blogs, I feel like I'm in a marathon LOL!! Up, UP & AWAAAAAAY!! Hi Kellie, love to win your bottle caps. How sweet! Please visit my blog, too. I am the author of "16 x MOM: A Mastery of Motherhood." I am giving away my book and a couple of laminated 4 leaf clovers. I love these magnets - so creative! Please enter my name in to win! If you haven't already, please stop by my blog where I'm giving away an original painting (by me of course!) I'd love to see you there! These are really original! I'm always posting up notes several medal surfaces - the magnets would certainly brighten things up. What lovely work! I am thrilled to enter. So unique!!!! Pleasepick me up! And thanks for the chance!!! Hello and greetings from Virginia. What awesome bottle cap magnets! Please throw my name in the hat for a chance to win such a wonderful gift. I would love for you to hop on over to my blog for a visit. I am #78 on the OWOH participant list. What a generous giveaway! thank you so much for the chance to win these cute magnets! Love your little magnet set. Thanks for the chance to win. What a cute giveaway! My fridge is covered by a maddening array of mismatched magnets and I'd love to be able to add yours to the mix. You have a lovely blog. I really enjoyed my quick look around. Please enter me in your giveaway and visit me, if you haven't already. I'm number 11 and my information is on my profile page. Greetings from Kansas, Your popcap magnets are awesome...count me in please. Please add my name to your hat! Your soda cap collection is awesome! I am # 267 on OWOH and I would love to win! Cool magnets! Please count me in. Thank you! Very neat magnets! Please enter me into the OWOH give away. I hope you can visit my blog, too. I'm giving away a shabby chic denim necklace. Come chat any time. hello, i'm glad i visited your blog in time for a chance to win your giveaway! if you haven't yet, i hope you can come and visit me at http://peggyapl.blogspot.com and join my OWOH giveaway. Very cool magnets! I would love a chance to win them! Thanks for being part of One World One Heart. What a glorious event. Girl.. YOU ROCK! for real.. you got some way cool ideas ..love them.. Please count me (us) in! Yes, please add me to your beautiful give away ! Such cool ideas !!! And Greetings from the Northwest where I am sliding in late to say, yes, please include me as well!